"Fiber Optics Not a Real Thing"
FOA Online Fiber Optic Reference Guide It keeps expanding- now available in book form - and online with "Google Custom Search"
Q&A: Where to place attenuators, how to find "dark fiber" for lease and who makes composite cables. Surge Past Five Million. David Chaffee's FTTH Prism newsletter. Verizon: No More Copper Landlines! 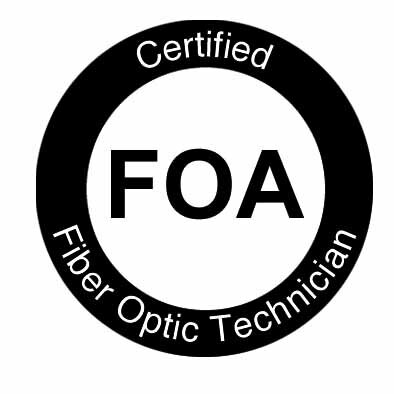 It's now CFOT� The FOA CFOT� (Certified Fiber Optic Technician) is now a registered trademark. With over 25,000 fiber optic techs holding CFOTs and the CFOT being recognized worldwide as the foremost certification in fiber optics, the FOA realized the value of the CFOT required trademark protection. Now it's official! Want to know more about fiber optics? Looking for specific information? Study for FOA certifications? Here's the largest technical reference on the web: The FOA Online Fiber Optic Reference Guide. 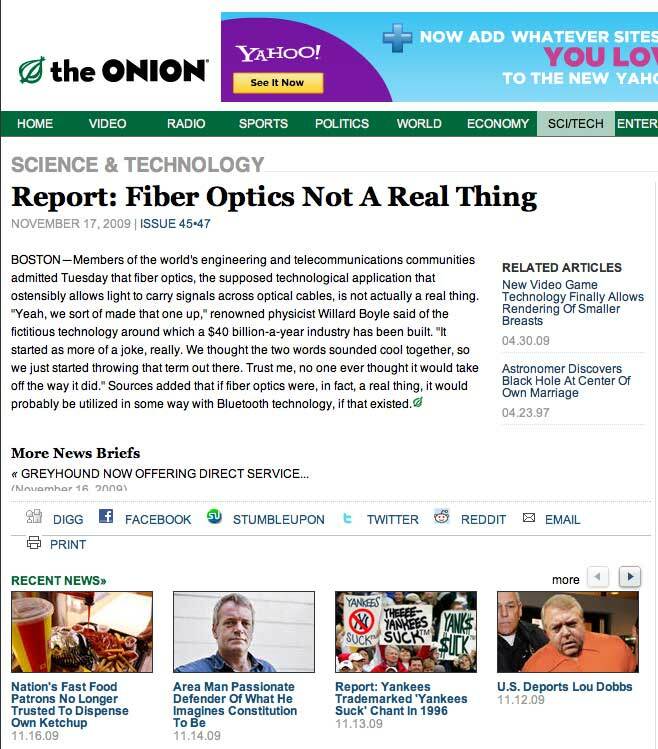 The Onion, in case you are not familiar with it, is a famous humor/satire publication. The fiber optics industry should be proud to be lampooned by such a prestigious publication! MIT Technology Review, reporting from the Frontiers in Optics conference, described a presentation by Jeffrey Kash of IBM on the future of supercomputers. To reach the next level will require optical components to speed up processing and reduce power. Kash predicted that optics would be replacing electrical backplanes by 2012 and replacing electrical printed circuit boards by 2016. By 2020, optics could be directly on the chip. A more conservative estimate predicts that by 2020 all off-chip communications need to be optical. More. TIA held a meeting of the TR-42 Telecommunications Cabling Systems committee in Jacksonville, Florida recently. We have mentioned they were planning to discuss the connector loss specification in TIA-568 but they also are discussing reorganizing the fiber optic committees. Here are our observations from the meetings. The TIA TR-42.8 fiber optic structured cabling committee met in Jacksonville during the first week in November. Several items of interest were discussed but few issues were settled there. The most important issue for fiber optics was the discussions on lowering the standard for connector loss in installed cable plants. The current standard calls for a maximum loss of 0.75 dB which creates problems when designing cable plants for high bitrate multimode systems like 10 and 40 gigabit Ethernet. The power budget for several of these links is lower than a typical TIA-568 compliant cable plant which will have 4 connections. International cabling standards have adopted a statistical distribution of connector loss, where the mean loss is 0.35 dB and 99% (3 σ in statistics) must be lower than 0.6 dB. This is certainly reasonable for most adhesive polish connectors and allows a number of prepolished/splice connectors in the link. The 0.75 dB loss maximum is needed for the new 24 fiber array connectors. Maybe a different standard is required for field and factory terminations. What’s Happening To The TIA Fiber Optic Committees? First a bit of history. TIA assumed responsibility for coordinating US fiber optic standards in the early 1980s. There were separate groups working on components (FO-6) and systems (FO-2). These groups worked diligently throughout the 1980s and 1990s to develop the standards that allowed fiber optics to become a mature technology. Yes fiber optics, now used commercially for over 33 years, should be considered a mature technology. Fiber became so mature, that by the end of the 1990s attendance at standards meetings began to wane in part because of the lack of urgent projects. The committee then merged FO-2 and FO-6 into FO-4 and merged many of the committees that had existed for many years. In 2008, TIA merged FO-4 into TR-42, the Telecommunications Cabling Systems committee and relegated fiber optics to a few committees covering systems, components, fiber and cable and metrology. It’s important to note the TR-42 committee calls itself TR-42 Telecommunications Cabling Systems but describes itself as Engineering Committee TR-42 develops and maintains voluntary telecommunications standards for telecommunications cabling infrastructure in user-owned buildings, such as commercial buildings, residential buildings, homes, data centers, industrial buildings, etc. What about outside plant fiber optics? That represents the bulk of the market. I think the answer is that activity has become concentrated in international standards committees and US-only activities are becoming irrelevant, except as included in TR-42 for premises cabling. Even TR-42 is undergoing pressure to align with international standards. TR 42.11, the optical systems committee, has been discussing revisions to TIA 526-14 MM Cable Plant Attenuation (OFSTP-14) but instead will request adoption of the international standard IEC 61280-4-1 ed.2 instead. The Nobel Prize awarded to Dr. Kao led to an discussion within the FOA regarding the many people we've known who were part of the development of fiber optics. Not all made big discoveries or invented famous things, but all contributed to the development of our industry. Some were involved with fiber, some with cables, connectors, splices, hardware, communications equipment, some developed new applications, but all contributed to our industry. To celebrate the 15th anniversary of the FOA next year, we're going to recognize some of those "unsung heroes" of our industry. And we're asking you to help us decide who gets recognized by sending us your suggestions. Tell us who you thinks deserves recognition and why - send an email to jim@thefoa.org with the subject "Hero" and a few words why this person was important to the industry. The FOA's new textbook and CFOT certification reference, FOA Reference Guide To Fiber Optics, has become a "best seller," outselling our previous textbook by 3 to 1. We assume the popularity of the new book is partly its cost, only $24.95 list from Amazon.com, but also the more up to date content and better organization. The success of the FOA Reference Guide To Fiber Optics has encouraged us to start work on another new book to provide a reference guide to our CPCT premises cabling certification. The FOA CPCT certification is becoming more popular, since many manufacturers have greatly reduced their premises/structured cabling training due to the current state of the economy. FOA CPCT training, which covers fiber and wireless in addition to the typical UTP/Cat5-6 training, can be added to a CFOT course easily, since it can be covered in two additonal days. The new book, FOA Reference Guide To Premises Cabling, is already in the works with a release date early in 2010. For now, you can find information on premises cabling in the FOA Online Reference Guide. Outside plant (OSP) fiber optics is the next project for the FOA, starting with a update of the The FOA Online Fiber Optic Reference Guide for more materials on OSP to provide the reference for a OSP specialist certification and become the foundation of another FOA book, the FOA Reference Guide To Outside Plant Fiber Optics. In the near future, we will be adding information on the OSP certification, including topics and KSAs, to the FOA website. New FOA Book Available from Amazon.com for only $24.95. That's FOA President Jim Hayes, the guy behind the new book, reading a copy. 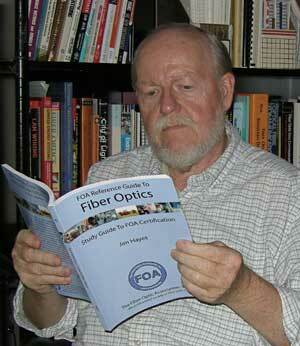 The new FOA book, the FOA Reference Guide To Fiber Optics, is finished and available from Amazon.com for only $24.95. The new book is intended to be used in training for FOA certification and as a reference book for everybody interested in fiber optics: contractors, installers and end users of fiber optics. It's complemented by our Reference Website and complete curriculum materials for teaching fiber optic courses. This book, which benefits from 12 years of experience with our previous book, The Fiber Optic Technicians Manual, is more comprehensive on many important topics and better organized for use both as a reference and as a textbook. It's developed from our Reference Website which complements the book and covers many subjects in greater depth. And since we are self-publishing the book using more modern "publish on demand" technology, it will be easier to keep up to date and much cheaper - as you can see from the price! 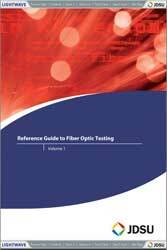 The FOA Reference Guide To Fiber Optics and The FOA Online Fiber Optic Reference Guide website will be the official reference for the 2010 CFOT exams. Here is more information on the FOA Reference Guide To Fiber Optics. Order from Amazon.com for only $24.95. The FOA Online Fiber Optic Reference Guide has become very popular - perhaps the most popular technical website ever, typically with over 30,000 users monthly! We continue updating materials regularly, keeping it as up to date as possible. Africa has become a very active area for fiber optics as they build up their telecommunications capacity. Even where they use satellites for remote areas, they need fiber optics for local distribution, leading to a need for trained techs. The FOA is proud to be a part of the development of Africa's communications systems. Q: Our link is only going .91Km over single mode and needs to use attenuators. Where do we place the inline attenuators? On the TX or RX side? Also do you have a chart that shows single mode wavelength and distance and what dB attenuator to use, like a 5dB, 10dB, etc? Q: Our County Planning Department has been asked to map locations where fiber optic cable is available. The planners would like to promote the availability of fiber optic as a "plus" to recruit new businesses to locations where it is available. Can you put me in touch with a fiber optic organization that knows fiber optic locations so that this information can be assembled to help promote economic development for the county. A: There are millions of miles of fiber around the US and the world, so it's hard to keep track of them. Contacting local telcos and LECs (local exchange carriers) and CATV companies will get you started. New England Fiber has a data base of installed fiber around the country. They can be reached at info@nefiber.com. Also, look at their web site http://www.nefiber.com/. Q: I am in search of a cable product which contains both copper and fiber with a robust outer jacket. 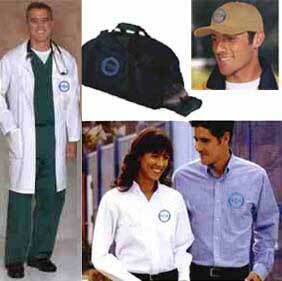 At this time I have had little success in finding a suitable manufacturer. I wonder if you have any recommendations or referrals. A: What you want is called a "composite fiber optic cable." You won't find too many "standard" cables like that but there are specialty cable manufacturers who make custom cables like this all the time. Many are used for underwater remote-piloted vehicles used for exploring, and of course, those cables are water-tight also. Q: Currently my Utility District is in the process of designing and bidding out the installation of 51 miles of fiber cable and I am trying to find information on creating a cost estimate for this work. Would you have any information on average installation costs for various parts of the country? A: The FOA a tutorial on estimating on our "Tech Topics" website (http://www.thefoa.org/tech/estimate.htm) and the table below has some labor units that may prove helpful. I would also suggest talking to the cable manufacturers to see what they say, as they have the most experience with their products. Q: Why do we count the connectors on each end of the link that will plug into our equipment as one connector alone has "no loss"? If you could shed some light on this subject it would be greatly appreciated. A: We count the connections on each end for several reasons. 1) When we test the cable plant per OFSTP-14, we use launch and receive reference cables which will include the end connections in the tests. Without including them in the loss budget, we would reject many cable plants because the tested value will be higher by two connections. 2) Network standards include the connectors on the ends since most installed cable plants are from wall or rack connection outlets to another wall or rack connection. When equipment is attached, it will be done by patchcords which will have a loss when connected to the outlet. Adding them into the loss budget therefore matches the usage. GB Ethernet and fiber Upgrades. GE Fanuc Intelligent Platforms got a contract to supply a custom version of its Gigabit Ethernet switch to rumble around inside the US Army's Abrams tank. The US Navy recently awarded Boeing contract to upgrade and support the Gigabit Ethernet networks it is building on its guided missile destroyers. From Network World. The new FOA reference website is now online. New sections have been added on fusion splicing and mechanical splicing. Check out the current Table of Contents. Reference Guide sections on fusion splicing and mechanical splicing. HOUSTON, Sept. 29, 2009 - The number of North American fiber to the home (FTTH) subscribers now stands at more than 5.3 million, as deployers of end-to-end fiber networks continue to add more than 1.5 million customers a year, according to a study released today by the Fiber-to-the-Home Council. The study, which was conducted by RVA Market Research (www.rvallc.com) and will be presented tomorrow to the 2009 FTTH Conference & Expo in Houston, also found continued robust growth in the number of homes passed by FTTH networks, which rose to 17.2 million from 13.8 million a year ago. Five years after their deployment began in earnest, fiber to the home networks are now available to 15 percent of homes in North America. "The march to all-fiber networks is showing no sign of letting up in the United States and Canada," said Joe Savage, President of the FTTH Council, which promotes and tracks the growth of fiber to the home in North America. "Given the growing sophistication and bandwidth requirements of online and video applications, as well as the high satisfaction that current FTTH subscribers are expressing about their fiber service, the growing consumer demand for end-to-end fiber is now a fact of life and something that our members are working hard to satisfy." In addition to the 5.33 million homes connected to FTTH, the study found that the overall "take rate" - the percentage of those offered FTTH service who decide to subscribe - went up for the seventh straight six-month period, with the vast majority of providers experiencing take rates of greater than 50 percent. Download the accompanying charts on FTTH deployment. Led by Verizon's massive investment in FTTH technology in the deployment of its FiOS service, the fiber to the home industry in North America also includes hundreds of smaller telephone companies and other network providers, municipalities, planned residential communities and cable television companies that are making the move to end-to-end fiber to deliver next-generation video, internet and voice services. Given the almost unlimited bandwidth of fiber, FTTH technology is seen as an ideal way of "future-proofing" networks in light of the ever increasing consumer and business demand for faster networks and higher-bandwidth applications. Verizon is offering faster FiOS speeds in NY and even getting into the TV biz with a local channel. Telephony. In Norway, You Might Have To Bury Your Own Cable To Get FTTH! A Norwegian triple-play provider has a unique solution to the pesky problem of digging up consumers' yards to bury fiber-to-the-home. Lyse Tele, an overbuilder that launched its fiber-based all-IP solution in 2002, installs the fiber right to the edge of a customer's lawn, then gives the customer instructions on how to bury their own fiber cable to the house. Exciting East Hartford, CT engineering firm in the fiber optics industry has the need for an out of the box thinker and design expert. You will be supporting contracts to provide lighting for naval surface ships. Work with a strong and experienced management team. Great opportunity for the right individual! experience related to electro-mechanical components assembly, illumination systems, and testing. Given the nature of the work, US Citizenship is required and Secret Clearance a plus. Build the fiber optic illumination system components. Test the components and systems. Assist in the expansion of the optics lab and R&D capabilities. Assist in the development and fabrication of new illuminators, lamp reflectors, luminaires, and other non-imaging devices. Assist in the characterization of the emission and performance of different light sources including metal halides and LED’s. Provide support in the development of the technical documentation and the data deliverables pertaining to the illumination systems. Assist with testing, qualification, installation, and system integration at the test facility and at the customer site (shipyard and/or US Navy vessel). What is the difference between a "visual fiber tracer" and "visual fault locator"? The FOA CFOT and CFOS programs continue to gain momentum in fiber optics. Over 27,000 CFOTs have been certified by over 230 schools. Since our founding in July, 1995, we have dedicated ourselves to promoting fiber optics and professionalism in fiber optics personnel, focusing on education and certification. We are continuing to add new schools and more CFOTs as users of fiber optics learn that a CFOT is the indication of a professional, well-trained fiber optic technician. Now with FTTH (fiber to the home) finally taking off, demand for CFOTs is rising and schools are responding by expanding programs rapidly. The FOA now has approved programs at 200+ organizations, welcoming new additions like the Joint Apprenticeship and Training Committee of the International Brotherhood of Electrical Workers, Corning Cable Systems and AFL (and their new acquisition "The Light Brigade" for their installation training programs) and NASA's Goldstone Tracking Station. The complete list of FOA-Approved schools is at http://www.thefoa.org/foa_aprv.htm. A "visual fiber tracer" is a low-powered visible source that when coupled into a fiber allows tracing fibers or checking polarity. A "visual fault locator" has a higher-powered laser source that can also be used to find bending losses or breaks in fibers where the jacket is translucent enough. See the FOA Reference Guide for more info.